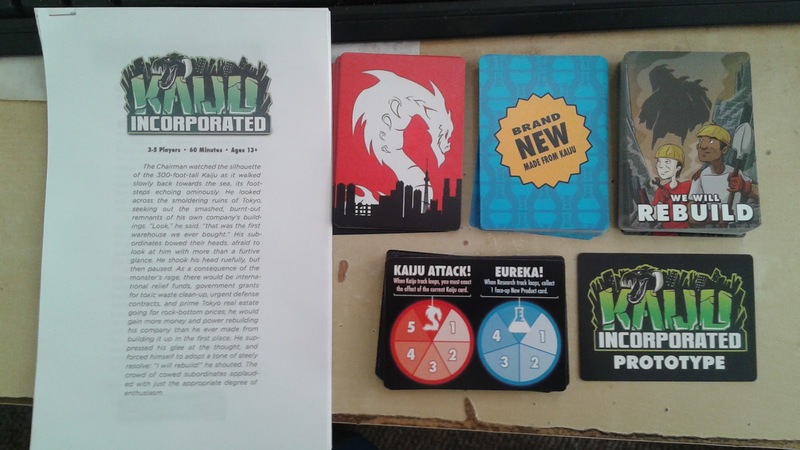 Something Different: a Review of Kaiju Incorporated. I've never done a review of another game on the Inspired blog but I figure this is as good a game to start with as any. My impression of the premise is that you play a ruthless multi-national corporation who is trying to profit from rebuilding in the wake of a massive kaiju event. So we're off to a good start. 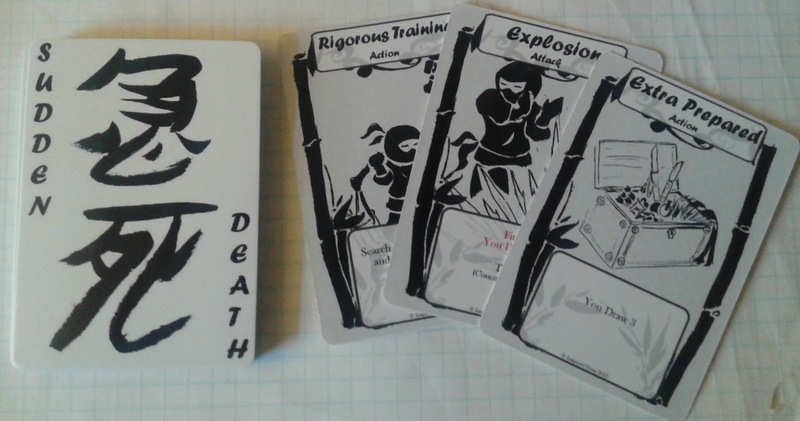 This is prototype card game from +Evil Hat Productions for 2-5 players. It's a little over 100 cards in 3 main types: properties, kaiju, and stuff. There are also faction cards but they are identical mechanically, so I'm not counting them. Their only difference is the city they favor. The property cards have a few important stats. Most obvious is that they are color coded (red, yellow, blue) followed by them being either your-turn or rival-turn. Each also has a city associated with it which is a big pile of potential VPs come endgame. Lastly, but vitally, is the income generated by owning the property. For 3-5 players you start out by picking a faction randomly. Each one has 3 'your turn' properties with identical city and income ratings but different colors (suits). The city on these starter cards is the capital city of your faction's home country. These cities are not repeated on the cards you can draft. Once you get your starters all set out you need to set your research and kaiju attack tracks to 0 and your bank to 5. The kaiju and research trackers are wheels and they will loop around repeatedly throughout the game. When they do, you either get swatted by the current monster or get to pick a new stuff card depending on which track maxed out. The kaiju mainly do bad things to you like destroy your properties, but there are a couple who only punish you if you are winning. The stuff (new products technically) are the other source of VPs beyond just collecting cities. So with that done, you flip over the top 3 stuff cards so people get some choices when they pick which one they acquire, and these replenish immediately when taken. Then you flip the top card of the kaiju deck to see the active monster. The baddie stays around until its trigger condition is met, then you discard it and flip the next one. When the stuff deck is depleted it's game over (there are some handy Kaiju-skin Handbags that go at the bottom, once they go out that's the last turn). When the kaiju deck is run through, you shuffle and keep going. The monsters don't go away just because they've all had a turn to mangle your bottom line! A turn starts by flipping over cards from the properties deck. You flip 1 plus one more for each player, and then each player takes turns choosing which property they want from those revealed. In order to avoid the same person always going first, the player who chooses first each turn shifts around the table. Once you have your property chosen, you decide to either buy it or generate income from it. If you buy it then you put it in front of you in a column with other similar cards (same suit and type). If you have all 3 suits and rival/your types you will end up with a maximum of 6 columns. Table space might become a premium. If you don't want to buy the card, you can instead discard it to gain income. In this case the specific card is only relevant for its suit, all other stats are ignored. You then gain cash and advance your research and kaiju tracks by adding up all the numbers for those on the 'your turn' cards of the discarded card's suit. Once you do so your opponents also gain income based on the discarded card's suit but naturally they only count their 'rival's turn' assets. Play continues in this way until the Kaiju-skin handbags appear and then you count VPs. This takes roughly 10 minutes per player. The art is amusing and the puns and references to major kaiju franchises of the past had me giggling every time a new one showed up. I was reminded of Machi Koro while playing due to the your-turn/rival-turn mechanics and the need to draft multiple suits of properties. I also like how there were special rules to make the game work better for 2 players. Without that it would very quickly get tedious with only one person to play rival-turn cards against. There's a depth of strategy as well that gets more complex as you add more players. Everyone wants to get at least one property from each city to get maximum VPs and they all want to have the most of their own city for the bonus. This means sometimes you want to grab another player's city so that you can deny it to them. Where it gets more individual is in how you go about tailoring your suits and types. In games I've played there is no obviously optimal strategy, but rather it is influenced by what other players are doing. Sometimes one person focuses on a single your-turn color, which means it is now valuable to stock up on rival cards of that color. Other times people focus on diversity so that they can always advance regardless of what cards are available, and I'm personally a fan of loading up on rival cards so that other people's efforts benefit me all the time. That last one seemed optimal at first but since most cards advance the kaiju tracker it means that (to borrow a phrase from Fiore) you have shown them how to hurt you. Once you eat two or three kaiju attacks in a turn you will know what I mean. In all, if the final game is like the prototype I'll be getting it. Sudden Death might be my favorite thing we've come up with at Inspired. It combines my interest in simple gameplay with ninjas, in a package that takes less than five minutes to play. That's not to say I don't like complicated games, but I prefer ones where the complexity comes from the strategy, not from complicated rules. Go is a classic example of the type of complexity I prefer. It has very few rules, but a tremendous amount of complexity during play. 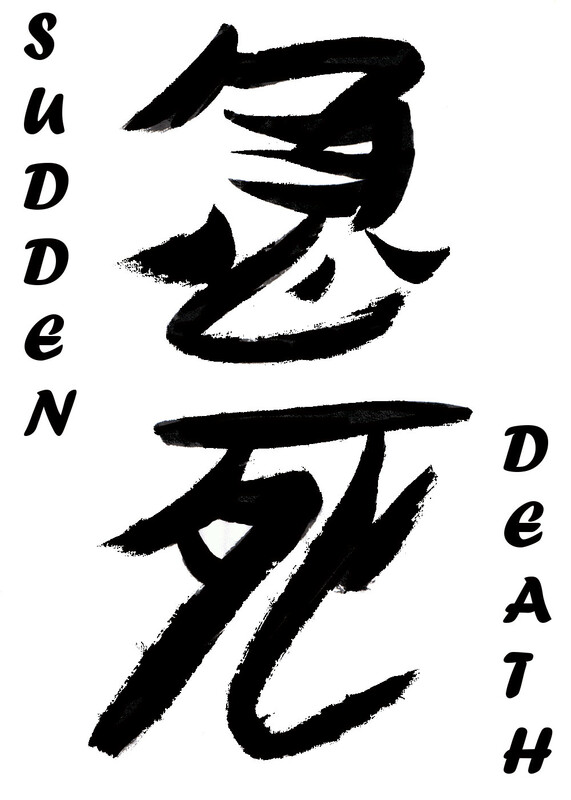 Sudden Death's rules are extremely simple, and while it is nowhere near as deep as Go, it does have some complexity in how one forms their opening hand and tries to control the flow of the game. The more important side has a lot more going into it. The art is sketches from +Laura Hamilton. All other layout is the work of +Christopher Andersen . He made the frame and sized the images to fit. There's no substitute for playtesting in game design and the most useful kind is that provided by people who don't have the creators hovering over them or playing against them. So we're looking for people who want to get a playtest version of the game and ruthlessly tear it apart while documenting the process. There will be a form for that and more info in our next post once we finalize our end. Until then, feel free to ask any questions you have or volunteer yourself to CJ or Erik. Time really gets away from me in the summer it seems. Time to talk about gaming to beat the heat. Lately I've been going back to my original gaming passions: wargames and RPGs. The first Inspired-related thing I ever wrote was Celestial Warriors. Lots of fun, needs a new version. The first non-RPG game I've done is Battle Tank. So I've gotten back to my roots by hacking some RPG settings and making wargame terrain. I'm working on two setting hacks that are both using FAE. The first is a genre blend of cyberpunk and wuxia that I've done some short fiction about and that I am calling Chrome-Fu. I've changed the approaches to use the 5 Chinese Elements and liberally provide boosts when people use the elemental generation/overcome interactions. The character sheet has the wheel printed on it to help people remember what those interactions are. The other is a Magic the Gathering game where we blend FATE with actually playing Magic. The colors+artifact are the FAE approaches and there is a separate hierarchy of meta skills to handle how the cards interact with play. This determines some basic things like Library, Hand size, color identities, rarity, and number of lands. My terrain binge has been mainly hills and natural features. The hills are pink insulation board cut up then painted brown to seal them. I use spray glue (which would dissolve the foam, hence the paint) to add screened dirt for texture and then green flock for grass. Different amounts of green give me some different looks so I have some that's pristine green ground cover and some that's pure dirt to use in heavily contested scenarios where artillery and fire would have denuded the earth. The pieces are pretty square, because it takes a lot more effort and material to get more natural features. I have some more realistic looking pieces, but I needed quantity of features to cover the table and that meant saving time more than anything else. I still cut and sand the edges to get sloped sides, and several pieces have multiple levels. One actual advantage of square sides is you can fit several pieces together and get larger plateaus free from gaps. Aside from basic hills I've made a significant amount of hedges to use as bocage in both 1/72 and 6mm scale. The 6mm hedges double as waist high verge for 1/72. All told I have about 30 linear feet of hedge now. I've also made a few dozen shell-hole pieces on 3" bases. I use them to show both pre-game shelling and for Boots on the Ground for in-game changes to the terrain. My next project is wire and obstacles. Some minefields would be nice. Lots of things are still burning in the background. There's been some bumps and some re-alignment of priorities lately. The bump is mainly demands on our time from the everyday intrusions of life. The re-alignment is due to research and game-playing. Some ideas are getting dropped or at least pushed way off due to lack of direction on our part, and in the case of Drachenheim we've had to do some soul searching about what it can offer that's different from some great, similarly dragon-centric games that have come out lately. I believe we have the answer to that question though so more news in the weeks ahead. It has been awhile since I've had much to say about what we've been up to. Too long really. But here I am and there are things to be said. Now with one of those names that burrows into your soul! More seriously, geeks like us believe that chemistry actually is fun and we want to see more kids getting into it. To that end this card game teaches how to make Lewis Dot diagrams starting with the Rule of Eight elements: Hydrogen, Carbon, Nitrogen, Oxygen, and Florine (HCNOF). The main piece of information you need to play is the Rule of Eight itself. You need to know that CNOF all must have 8 electrons in their valence shell in order to be stable and that H must have 2. The cards list the base valence electrons, the approximate electronegativity and the formal charge each element has with each possible number of covalent bonds.The Group # is also listed to help new students start to see patterns in the chemistry of the columns on the periodic table. These prototypes don't have the full atomic symbols with mass and number but they will in the next iteration. I've been rewriting and going back and forth on this one for a long time now. At this point it's finally starting to work. At issue is the complexity of sword fighting and the constraints of a card game. The goal is to have something that emulates the decision making and physical realities of a fencing duel without being so technical it bogs down. To that end I've hacked the number of unique cards down to twelve and built a pair of 41 card decks to test my new design. This game is done (more or less) and is off to the draft/prototype phase where we get something like Gamecrafter or DriveThru Cards to give us a better version than the prototype we are using. We'll hand a few out to get people playing and do some demos at the local game stores. If that goes well we'll be looking to try and get it into production again with finished art. 16 Bit Tactics needs more monsters. It needs me to work on the gear section as well but monsters are more fun and so they win out. So to that effect, today's post comes with an updated monster doc. I've added damage affinities (Weak, Strong Absorb) to all the existing entries and as you can guess from the title and the adorable creature pictured here, I have also added Flayers as a monster type. Flayers blast your mind. At low levels they aren't that scary, all they do is squiggle with their tentacles and spray ink at you (Blind). Mid-level ones have the irritating ability to dispel your positive statuses and high level ones have Mind Blast. And that's always bad. One thing to note is that all these attacks also deal full, normal, dark element damage. So they can't just be laughed off and the statuses removed. You'll need items or plenty of MP to handle these guys. The monsters are still on my mind so here's the upcoming ones: Hydra, Demon, Dryad, Coerl, Chocobo, Automaton, and Minotaur. In addition to the additional types of monster will be variant monsters. If you look at the doc now, you may notice that all dragons breath fire and that all flan are water-type. Those are some obvious ones begging for variants. In most cases a variant is as simple as just changing the element of an attack and altering its damage affinities to conform. Sometimes though, you aren't just switching out a power but adding a new one. Maybe you want to make one of the monsters a spellcaster, so you give it Thundaga. In this case, the monster might be more dangerous than another monster of its level so you need to increase the XP awarded. To figure out how much, I'll be going to the school of B/X D&D and counting special abilities and then setting an award based on that. The current XP/AP system only uses level as well as relative number of monsters and PCs to determine the XP/AP award. It doesn't count monster type. Ah, holidays. This entire time of year, from Halloween to New Year, tends to get devoured and all I have to show for it is a couple new monsters for 16-Bit Tactics. Skeletons and Ghosts make their first appearance. I picked them to get a physical and a non-physical undead up and running and, of course, because I have LEGO figures for both. I have zombies and mummies as well, but those two will have to wait. Skeletons have a mix of attack types as they level: a melee attack, a ranged ice attack, and an AE drain. Their physical attack does the most damage, but the others have status effects and can be useful against those with low M.Def/M.Eva. They are pretty typical fighter types otherwise. Good DEF, middling M.Def, high HP. Ghosts have only magic dark attacks. Two are melee; one sleeps the other drains and poisons. Then they have an AE ranged dark blast. They have lower HP but top rate EVA/M.Eva, and since they are insubstantial they have Resist Physical. So even though they have no defense (it's the same as their evasion ratings so it almost never applies), they still take half damage from all physical attacks. Best break out the spells on these guys. They also float/fly and no one seems to like fighting them for some reason. The unique part about undead though is that they don't stay dead for long. When reduced to 0HP they gain a countdown effect. When the countdown runs out they revive with half HP. The only way to stop this is to apply an effect that cancels Doom. Holy Water is one way. Reraise is another. If those aren't options you still win the battle if all the enemy are KO'd, so you can time it to take all the undead down within 3 rounds of each other. One major thing adding undead has made me think off more is how to make the elements more distinct. As of right now there is really no difference between them and few abilities reference an elemental type other than to color the damage. Clearly this will not do. I already have the Resist keyword so to make this work as a minigame that encourages characters to buy different elemental abilities I need to add two more keywords: Weak and Absorb. There will be no Immune condition since I don't like when nothing happens. With this system either you get less damage, more damage, or you heal the target. Undead typically Absorb Dark and are Weak to Fire and Holy. To get this in I will be using some of the white space left on the monster sheets to add an Elemental Affinities section that will list how they react to each element. Broader traits like the Ghost's Resist Physical will not be spelled out here since they are so powerful they will continue to occupy a Support ability slot. Only Monsters is updated. The others are for convenience. As promised, I have been working on 16 Bit Tactics. Below are 4 links to get all the current parts of the game. With these you have everything you need to play, but not everything I want to give you. In particular there are no guidelines on how to set up battlefields, nor are there any stats on how the power of characters and monsters compares at different levels. A Level 2 creature is undeniably more powerful than a level 1, but I have't crunched the numbers to tell you how much more dangerous it is. Summoners are also incomplete. All their job abilities are costed and written up, but what their summons actually do is not detailed. This is because I can't decide on what they should actually do. I am torn between them being one-shot spells like in many of the older games, or if they should actually create a minion on the battlefield that the summoner can then control. The first method makes them similar to Black Mages but with added utility, since some of the summons have status or support effects as well as nukes. The second method makes Summoners much more tactical and would serve as a good base for when Beastmasters are introduced. It would be simple enough to make a monster template for each summon and then let the summoner spend their actions to command the creature each turn. The Gear section is very bare bones as well. I have not finished the costs of equipment because I haven't finished the loot system for Tactics yet. So this means I have no information on what items you should expect to have by level and there are, as of yet, no consumable items. Next on the docket is formatting the rules document, then combining everything into a single file. From there the monster section needs to be expanded with more types of enemy, and consumable items are a must as well. To get to the consumables, a robust loot system is needed so that you know how much GP to expect for each character and what a defeated enemy should leave behind. A full character sheet is on the list as well. Right now I just use index cards to note what a character has equipped and its cumulative stats. The Job tracking sheets are used to keep track of AP gained and spent. And with that said, an experience system is needed. How much XP and AP should a character earn? Currently that amount is 1XP and 1AP per level of the defeated enemy. Add up all the enemies and then divide this among the PCs. Since it's linear and the power curve is a very steep linear curve it makes lower level enemies much more valuable for the effort expended. 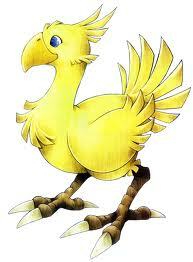 I've also thought of squaring the level of a monster to get its reward. I don't know if this will work yet. Finding the right number to level up is tricky as well. 100 is too much and 25 is too low to just be linear. I think 25*(current level) looks reasonable. That would mean that it takes 1125XP to get to level 10 which gives you enough AP to completely master 2 Jobs and make progress on a third.